↑ Graham, William (21 December 2015). "SpaceX returns to flight with OG2, nails historic core return". http://www.nasaspaceflight.com/2015/12/spacex-rtf-core-return-attempt-og2/. Retrieved on 22 December 2015. "The launch also marked the first flight of the Falcon 9 Full Thrust, internally known only as the "Upgraded Falcon 9""
↑ 3.0 3.1 Foust, Jeff (31 August 2015). "SpaceX To Debut Upgraded Falcon 9 on Return to Flight Mission". http://spacenews.com/spacex-to-debut-upgraded-falcon-9-on-return-to-flight-mission/. Retrieved on 18 September 2015. ↑ "Falcon 9 Launch Vehicle". 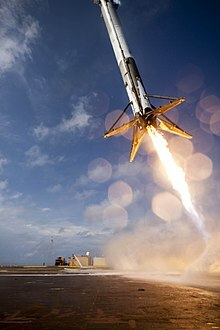 http://www.spaceflight101.com/falcon-9-launch-vehicle-information.html. Retrieved on 18 September 2015. ↑ "Falcon 9 v1.1". http://www.spaceflight101.com/falcon-9-v11.html. Retrieved on 18 September 2015. ↑ Clark, Stephen (October 11, 2012). "Orbcomm craft falls to Earth, company claims total loss". Spaceflight Now. http://www.spaceflightnow.com/falcon9/004/121011orbcomm/. Retrieved on 2014-04-05.